One of the missions of Bogor City to support the sustainable development is to develop the concept of Bogor Eco City (green, healthy and environmentally friendly). In the implementation of the program, the concept needs to be supported by basis data and monitoring system by using local data based on the data characteristics in Bogor City. To meet these challenges, CCROM SEAP in collaboration with National Institute for Environmental Studies (NIES) Japan developed monitoring system, reporting and innovative visualization through installation of system demo the used of energy in Bogor City as well as future simulation scenario of Bogor eco city based on parameter information and the green gas house emission. In order to further enhance the research collaboration CCROM SEAP and Bogor City Government have signed a MoU for comprehensive research cooperation. The signing ceremony was held in 29 August 2015 and witnessed by Mayor of Bogor City, Dr. Bima Arya Sugiarto and the Head of Cooperation Division of Bogor City. The signing of a cooperation agreement "Development and Construction of Bogor Eco City" was held in the official residence of the Mayor of Bogor and signed by the Head CCROM-SEAP LPPM IPB, Prof. Rizaldi Boer and Head of Bappeda Kota Bogor, Mr. Suharto, ATD, MM. 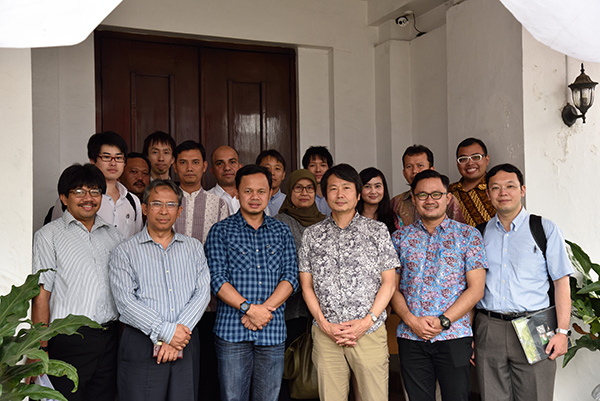 It is planned that after the signing of the letter of the agreement, CCROM-SEAP LPPM along with NIES Japan will install energy monitoring on government buildings, residential and commercial buildings in Bogor City to measure the energy used in Bogor City. Also, CCROM SEAP and NIES will provide future simulation scenario of Bogor eco city based on parameter information and the green gas house emission. Mayor of Bogor, Dr. Bima Arya welcomed the cooperation and look forward to future activities.